I really like the hat! Thank you for sharing the pattern. I too have been looking for a pattern for a nice cloche and haven’t found anything I liked until yours. Thanks so much for posting! I am new to crochetting. On rounds 8-23 the pattern states to “work even in . . . “. I don’t understand this. Could you explain further? “Work even in (stitch name)” means to keep to the same amount of stitches as the previous row (no increases, no decreases), so at the end of the round, you should have the same number of stitches. I like the helpful info you supply on your articles. I?ll bookmark your weblog and check once more right here regularly. I am quite sure I?ll be told many new stuff proper here! Good luck for the following! Anche la “favola di Cristo ” di Cascioni Ã¨ pura invenzione! Si beve proprio tutto! Si documenti prima. Sta facendo una pessima figura come persona per nulla attendibile. Povero Sal…. Forsure, you’re from NOR-CAL!! haha After accutane, my oily skin completely went away!! My face is no longer shinny anymore!! The only downside is my skin gets really dry easily. But it’s not a problem, I just used aveeno daily moisturizer and it keeps my skin hydrated the whole day. =] I still break out a little bit here and there. But it is only like a couple of small whiteheads. I don’t get cyst anymore. Haha It’s cool. I dont like scrolling through comments either.? hanna: Ja, det Ã¤r liksom som att det inte regnat pÃ¥ veckor nu istÃ¤llet. Men sÃ¥ lÃ¤nge regnet hÃ¥lls borta Ã¤r jag glaaad! 😀 Tack, tack! I like your pattern and appreciate the effort it took to develop and write it. Thanks! I don’t understand how you do 10 hdcs in a ring without a foundation ring. Do you first make a ring with chain stitches? If so, how many did you use for the ring? At the end of each round, join with sl st before beginning next round. What I did was chain 1 and then chain 2 for the ‘first’ hdc and then do the next hdc into the very first chain that you did. I used a Plymouth Yarn blend of 52% silk and 48% merino wool. Total yardage was 170. The yarn comes in 99 yard skeins. I love the design: it is a deep hat and the brim can be arranged in different ways. HOWEVER, my head measures 22.5 so I first tried the increase after row 7 adding two extra rows (to come between 22 and 24 inch sizes). It was way too big and I had to go back to row 7 and continue as for the small size of 21.25 inches. The hat fits fine and could even stretch to fit a 24 inch head, as far as I can tell. My gauge was perfect so I am not sure why the discrepancy. I measured my head just above the eyebrows. Now that I know the sizing, I will make more of these because I love the fact that it covers the ears and is so versatile. Thanks! Thanks for sharing your experience! My sister tried out the pattern in a 50/50 merino and wool blend and she had to go for a smaller size than her head measured out to be – our assumption for that is that the yarn allows for some stretch (if she made it the next size up, it would have been too big and not been ‘snug’ enough to stay on). This hat pattern (closhe) is so pretty. It works up fast and is so easy. I have made two so far and they are lovely. I worked the “ribbon” right into the pattern with white fizzy yarn for a little dressier effect on one. Thank you so much for letting us have this pattern. This was my first attempt at making a hat of any kind. This was so easy to follow and it turned out perfect. It only took me a few hours. Thanks for sharing the pattern! I love your hat and thank you for providing the pattern. This will be great for Christmas gifts. Have a great week! Thanks so much Michelle for the pattern. I have made 10 hats, each in similar colors for winter to give to mly friends for Christmas presents. They all raved over the hat when they saw it on me, so I thought I would make it for each of them as gifts. Thanks for being so nice and sharing your pattern. Thanks!!! Had lost my original pattern for a cloche style hat and was very pleased to find yours!!! Would you recommend this pattern for a woman undergoing chemotherapy for breast cancer? I think it’d be a good choice, depending on the type of yarn that you use. I like wool-blends myself. The important thing is to choose something that would keep her head warm and not be irritating. This hat is so cute! I have not made it yet but I am looking forward to! I am also wondering what your policy is about selling items made from your pattern? Thanks! For this pattern, I’d like it if people told me in advanced where they’re selling it. I’d also like either a link back to my website/pattern page and a line stating that the pattern/design is not by the seller of the finished object. Great pattern, thanks! 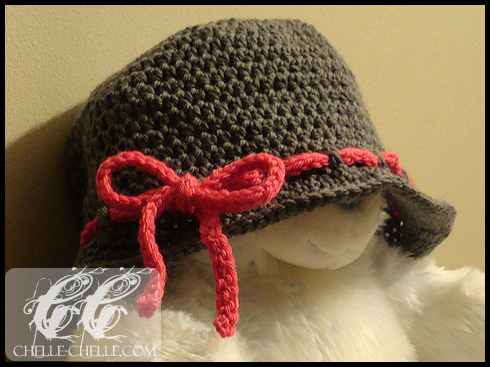 Found a cloche pattern on youtube that was o.k. but this is just as nice. Easy to follow pattern, looks great and easy to wear. I like Red Heart soft yarn. Worked up nicely. Thanks again for sharing your pattern. So you chain 3. Of the 3 chains, #2+3 count as 1 hdc. And then you do 9 hdc into the very first chain that you made. You don’t make a chained ring in the beginning, which makes for a much smaller hole. Thank you for this ! I like hats , so I will try to make it ! In making the ribbon, I would chain 140-190 and then what next? The instructions read: S into back loop of ch across, but I don’t know what that means. I’m so excited to get started on this tonight. Great xmas gift for my sister inlaw. I’m actually the author of the pattern 🙂 The instructions say “Ss into the back loop of the ch across”. You want to do slip stitches across the back loops of the chain across to make the ‘ribbon’ thicker. Oops, I meant to address it to you, Michelle. 🙂 Thanks so much. Just tried it out and that works perfectly. I made the hat last night and it is SO beautiful! I just love it. Thank you for sharing your pattern. 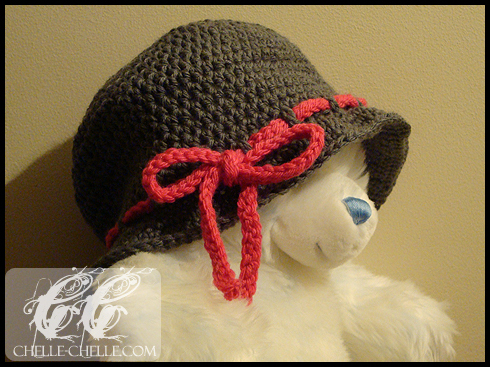 I want to crochet this pretty little hat but it doesn’t come together for me. I have been crocheting many years but something is missing for me. Is there some way you can clarify more clearly how to get from one row to the next? Thanks for any help you can give. 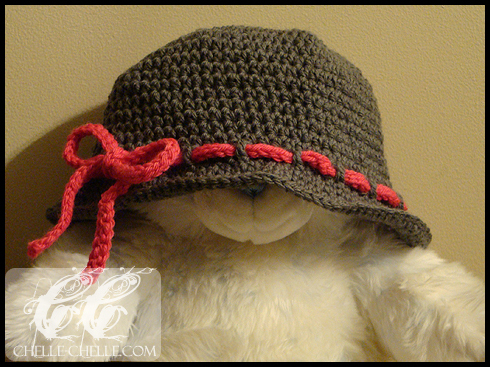 This hat is done in the round (continuous spiral) rather than individual rows with a chain to start the next row. A tÃ©rkÃ©p nekem kifejezetten tetszett, sokkal talÃ¡lÃ³bb egy folyamatosan fejlÅ‘dÅ‘ fantasy vÃ¡rosra, mint ami az Ã‰SZ-ben van. Ã–rÃ¶mmel konstatÃ¡ltam, hogy a vilÃ¡gleÃ­rÃ¡s is inkÃ¡bb a SummÃ¡riumban megfogalmazottakat bÅ‘vÃ­ti tovÃ¡bb. “Work even” means to do each round with the same number of stitches (no increases or decreases). Hope that helps! Michelle, this is the cutest hat ever, many thanks for the free pattern. Even though my head is quite large I ended up using the smallest directions with a size H hook and the fit is perfect. I was shopping the web for a hat in my school colors (University of Michigan maize and blue) and ultimately spent $5 rather than $30 + tax and shipping. I’m very new at crocheting and I’m doing the Ruse – A Cloche-Inspired Hat. I’ve done great until the part in the pattern where you say for Rounds 8-17 work even in hdc….what does that mean? I don’t understand. Thank you. Love this pattern, exactly what I have been looking for my only question is about how much yarn / skeins do you suggest using? Thank you so much for this pattern. My mother was just diagnosed with lung cancer and will be starting chemo soon. I love Kander's work. He's one of the leading commercial – portrait photographer at the moment. shooting most of the leading advertisements. He seems to be such a quiet person. this clip is more about him than his work. I agree totally about the difference between digital and film cameras. I am still in love with my old 6by6 film camera and the canon MK2 is just an instrument to me… thanks for posting, lovely change of theme ! My girlfriend is having her hen’s night which me and her maid’s are organsing was wondering what the price would be to pick up 5 women from spots around Canberra 2-3 will be at the same place in Tuggeranong drive around for a bit before final arrive in Civic at around 10pm?Maximum period of time would be 1.5-2hrs.With a maximum of 8 girls – number so far and has been for a bit is 5 including the bride. I found you through AllFreeCrochet(DOT)com and wanted to tell you I’m hoping to be wearing my new cloche tonight:) Great pattern, reading through it I can see it will be very easy and fun to follow as I crochet up what I’m thinking has to be the perfect cloche pattern I’ve found so far. I love-love-love the crochet ‘ribbon’ trim, that’s just pure genius, that is! I downloaded the pattern and all I got was a bunch of little boxes no pattern. I’ve never seen that before. Is there anything I can do to fix it? Sorry it took me a while to reply to you. I’ve tried downloading the pattern and haven’t had an issue with it. What PDF reader are you using to view the document?